We really can change and become transformed into Christlikeness. This book walks you through that process and invites you to live your daily life with God. Have you ever wondered how a person really changes? What truths are needed to be understood for this change to occur? What is the process of this transformation? These are the important topics of Dallas Willard’s landmark book, Renovation of the Heart. 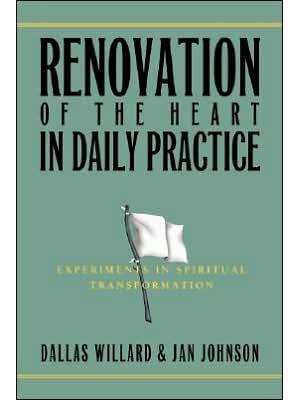 Renovation of the Heart in Daily Practice alternates back and forth between carefully chosen selections from Renovation of the Heart and selections of the same length by Jan Johnson. In Jan’s entries, she first explains the selection on “street level” or answers questions about the material. The second part of her entries offer “Today’s Experiment” – a hands-on, doable, relatively simple way to work through in your life the truths presented in the selection. In this way, she becomes your companion in walking out the important truths in this book. If you’ve found yourself really hungry to have your soul transformed – maybe you’ve read books about it but that was not enough, you’ll delight in being guided through sixty-one selections from Dallas Willard’s book, Renovation of the Heart. Ever practical, these sections conclude with “Today’s Experiment” to help you think through and walk out the truth you have pondered. This book is ideal as a daily meditation book or to use for personal retreats. (Suggestions for how to have a personal retreat and how to use this book on a personal retreat are included.) The goal is to guide you deeper into the heart of God while renewing your own. Director of Retreat Ministries at Liebenzell, USA: www.liebenzellusa.org.